Rough hands? Dry Cracked heels? Rough elbows? Well have you seen the Pumice King? Such a funny name don't you think? I have suffered from dry cracked heels since my 1st pregnancy and have had dry heels ever since. I swear by the Scholl Crack Heel Repair cream which is amazing stuff and give my heels a nice treatment every so often. I find that I need to keep on top of the dryness and roughness, I use a foot file normally which works wonders but thought this looked quirky and fun. They come in various colours of course I got PINK. You can use this dry or wet, I have tried both and found that using this dry works best on the heels but for removing stains then wet is best. I wouldn't say this is brilliant for removing or softening heels as well as my foot file but for a cheap alternative this is fine. Even if you don't use this for your dry/rough skin then this would be handy to have in your kitchen as a stain remover. 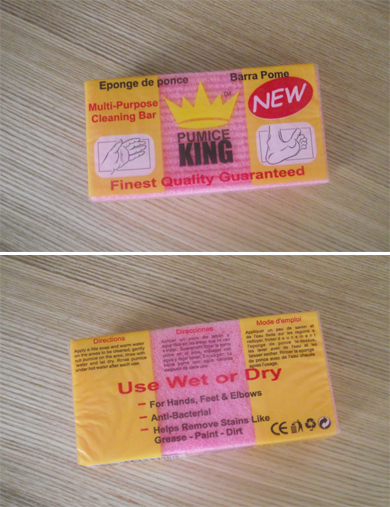 This removes stubborn stains like grease, paint or dirt. I must admit I had a stain on my carpet and have been using it for household tasks rather than for my feet. I will be sticking to my foot file for my dry cracked heels. Have you tried or seen this? I've contemplated buying one of these bc they use them in pedicures all the time.